WASHINGTON (Sputnik) - The Russian Embassy in Washington has lashed out at the US State Department for sending a wrong message to Ukrainian nationalists after it omitted a stalled inquiry into the 2014 Odessa massacre of anti-government protesters from its annual human rights report. "We are outraged that by silent consent the US administration deviates the Odessa events and the actual 'freeze' of investigation by Kiev. This is confirmed by the fact that in the recent State Department Human Rights Report there was no word about the condemnation of Odessa tragedy and numerous similar crimes in Ukraine," the Embassy said in a statement. 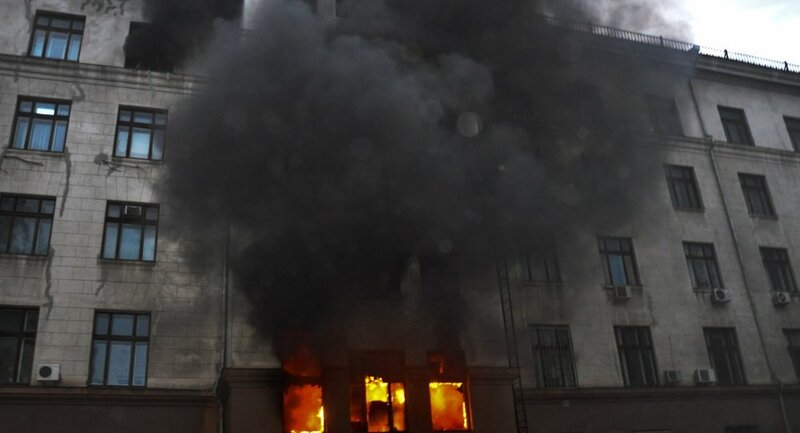 Wednesday marked the fourth anniversary of a blaze at the southern Ukrainian city's trade unions house, which killed over 40 people and injured hundreds more. The fire is believed to have been started by radicals and football fans who chased anti-government protesters into the building after disrupting their rally in the wake of the 2014 coup. The Russian diplomatic mission said it was deeply disappointed by the fact that those behind this terrible massacre had never been brought to justice, and warned about fostering a sense of impunity in Ukrainian radicals. "The inaction of the Kiev authorities in the investigation of this tragedy only contributes to the growth of extremism in Ukraine. Impunity gives nationalists a sense of all-permissiveness," the statement continued. There has been a rising number of cases in which Soviet wartime memorials in Ukraine have been desecrated, the embassy said. It added that Washington's unwillingness to use its influence on its allies in Kiev to address human rights shortcomings was hypocritical.